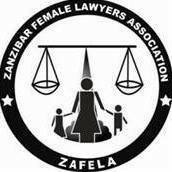 The Zanzibar Female Lawyers Association (ZAFELA) was established in 2003, spurred by the many challenges facing women and children in the community. ZAFELA seeks to ensure that women and children are no longer the victims of any form of violence by educating them about their civil and social rights, providing counselling and support through difficult life transitions, and safeguarding their future by creating awareness of their legal rights through legal aid. The organization acts as a forum for providing legal advice to governmental and non-governmental institutions dealing with the women and children; spreads awareness to women at all levels of Zanzibar law, especially that which affects their lives directly or indirectly; ensures their participation in moves to change the laws concerning them directly and hampering progress in the development of women and children; conducts legal research and lobbies for amendments or new laws to promote gender equality.